All aboard! The Gold Train 3 reel slot machine is on its way to 'slotsville' and taking players. This fun slot by Pragmatic Play has the potential to pay up to 500x your bet line. Although it is very simple and inspired by old, classic slot games, there are some great prizes up for grabs when you land winning combinations. Trains are very popular, whether you’re travelling across the country or practice modern machinery, Gold Train celebrates the amazing locomotives. The simple 3 reels are iconic to one classic arcade slots but these particular ones have been designed to look like train tracks. Although there is not too much to boast about, this slot is defiantly worth a spin to enjoy a game on a classic, easy to play slot machine. Click here to return to the homepage. Pragmatic Play is one of the leading providers of desktop and mobile casino games. Specialising in online casino slots, they have a collection of over 80 titles which includes Pixie Wings, Hot Safari and Gold Train. They are constantly creating, developing and launching new and innovative games that can be enjoyed by players around the world, of all interests and abilities. Easy Slots has many more games by Pragmatic Play, click the link to search for them! Don’t worry if you have forgotten your ticket as this train lets players on for free! That’s right, the Gold Train is available to play for free. 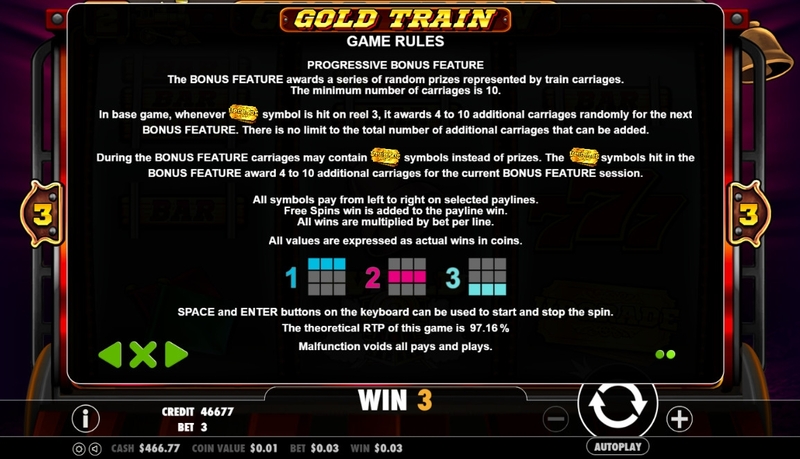 If you’re looking for gold on this train, however, you can also pay a fare from 3p to £15 per spin. A unique feature of this slot that isn’t common amongst 3 reel slots is that this slot will pay returns to layers if they land 2 symbols on one of the same reels from left to right. 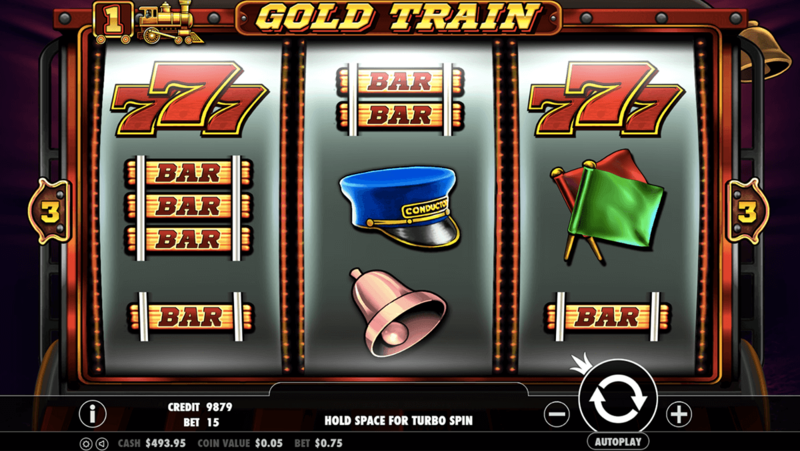 The symbols for this slot include the classic triple 7’s, bell, bar train tracks, flags and conductors hat. The wild is the train symbol that says ‘WILD’ one it. Landing 3 of these in a line pays 500x the line bet multiplier jackpot. The wild is definitely the best symbol to land and it has the potential to replace itself with others (other than then scatter) to help create winning combinations.